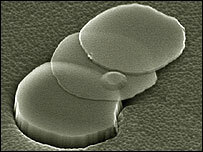 A nanofabric just one atom thick has been created at The University of Manchester. The graphene nanofabric belongs to the family of fullerene molecules (buckyballs and nanotubes); this is the first truly two-dimensional fullerene. The nanofabric sheet is described as stable, highly flexible and strong, and remarkably conductive. Researchers have concentrated on the electronic properties of the carbon nanofabric. It appears that electrons can travel without any scattering over submicron distances; this is an important property for making fast-switching transistors. As for other applications, graphene is basically an "unrolled" nanotube; most of the applications considered for nanotubes would also apply to graphene itself. Computer engineers will need graphene wafers a few inches in size, before considering graphene as "the next big thing". However, all the omens are good, as there are no fundamental limitations on the lateral size of carbon nanofabric." As soon as I read this story, the graphene nanofabric reminded me of the Gauzy, a feather-light tent described as being made of a material just one molecule in thickness, yet strong and flexible. The reference comes from Roger Zelazny's 1966 novel This Immortal; the novel won the Hugo award for best novel that year, and it is still great reading. See the reference stories here and on the BBC site.